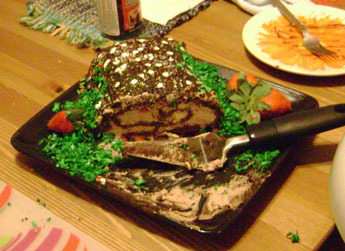 Every year I intend to do a Buche de Noel. I'm not certain I manage often. There was one last year, and I at least remember making it at my mother-in-law's house one Christmas when both I and my sister-in-law were pregnant (with our respective elder children)... and carting the recipe to Texas, but being stymied by the lack of jelly roll pans. At any rate, one bakes a flat cake - my recipe is basically a sort of meringue - the cake is only eggs and sugar with cocoa powder and vanilla, and then one puts a layer of flavored whipped cream in, roll it up, then ice it. 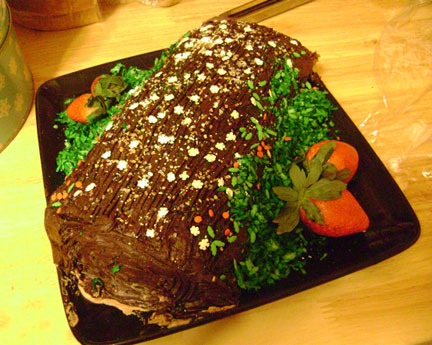 Technically, it should look realistic, but while I puzzle and sweat over the notion for a few days beforehand, in the end, I just dye some coconut green for moss, and make lines in the frosting with a fork, and sprinkle sugar over it (this one has four colors of fancy sugar, plus powdered sugar on it, plus snowflake shaped sugar decorations). Merry Christmas to All! And to all, lots of sweets.